Be the first to share your favorite memory, photo or story of Charles. This memorial page is dedicated for family, friends and future generations to celebrate the life of their loved one. 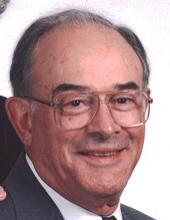 Charles Inman Simons, age 90, of Dawson Springs, KY passed away on Monday, December 3, 2018 at Deaconess Hospital, Evansville, IN. Mr. Simons was born on October 1, 1928 in Hopkins County, KY to the late William Mortie Simons and Mamie Elnora Townsend Simons. He was a graduate of the Louisville Mortuary School, Louisville, KY, and he served his country in the US Army during the Korean War when he served 18 months in Korea. He and his wife were partners in the ownership and management of Clark Beshear & Clark, a furniture and appliance store in Dawson Springs for many years until his retirement. He was a member and deacon of the First Christian Church in Dawson Springs. Mr. Simons is survived by his loving wife of 67 years, Betty Day Simons, of Dawson Springs, KY, one daughter ~ Sarah (Bob) Johnson of Madisonville, KY, one son ~ Jeff (Cheryl Lynn) Simons of Rockport, IN, one brother ~ Jim (Anna) Simons, Jr., Dawson Springs, KY, four grandchildren ~ Heather Orten, Clay Simons, Dr. Ben Johnson, and Cpt. Brad Johnson. Preceding Mr.Simons in death are his parents, a sister ~ Hazel Cox, and a brother ~ William Edward Simons. Visitation for Mr. Charles Inman Simons will be Friday, December 7, 2018, from 5:00 PM until 8:00 PM at Beshear Funeral Home, Dawson Springs, KY, and on Saturday, December 8, 2018 from 12:00 PM until the funeral hour at 1:00 PM at the First Christian Church, Dawson Springs, KY with the Rev. Mike Moschenrose, officiating. Burial will follow at the Rosedale Cemetery with a US Honor Guard Service provided by the US Army. Expressions of Sympathy may take the form of donations to be made to: First Christian Church, P.O. Box 77, Dawson Springs, KY 42408, or the charity of your choice. To send flowers or a remembrance gift to the family of Charles Inman Simons, please visit our Tribute Store. "Email Address" would like to share the life celebration of Charles Inman Simons. Click on the "link" to go to share a favorite memory or leave a condolence message for the family.